The rate at which samples are taken by the oscilloscope is called the sample frequency, the number of samples per second. A higher sample frequency corresponds to a shorter interval between the samples. 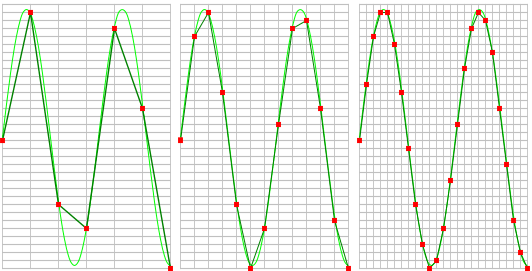 As is visible in the picture below, with a higher sample frequency, the original signal can be reconstructed much better from the measured samples. The sample frequency must be higher than 2 times the highest frequency in the input signal. This is called the Nyquist frequency. Theoretically it is possible to reconstruct the input signal with more than 2 samples per period. In practice, at least 10 to 20 samples per period are recommended to be able to examine the signal thoroughly in an oscilloscope. When the sample frequency is not high enough, aliasing will occur. Using hotkeys F3 (lower) and F4 (higher). Clicking the Sample frequency label in the combined Record length + Sample frequency + Resolution indicator on the instrument toolbar and selecting the required value from the popup menu. Right-clicking the horizontal scrollbar under the graph displaying signals from the instrument and selecting Sample frequency and then the appropriate value in the popup menu. Information: Depending on the instrument settings, the instrument can have certain limitations with respect to the available sample frequencies. When a user defined value is requested that is not available, the software will use the closest available value.